Add an upload button to your forms to collect files (max. size 10MB per upload) from your site visitors. Now available for all sites with Business hosting. ‍Style every state of the upload process. You can also restrict certain file types to limit the specific types of files your form(s) accept. ‍Choose what file type(s) to accept. And finally, you’ll see these files in your dashboard as download URLs with the rest of your form submission information, as well as in the email notifications that fire off when a someone fills the form out. For a look at all the features that come with this release, plus some ideas on what kinds of things you can build with form file upload buttons, check out our release blog post. 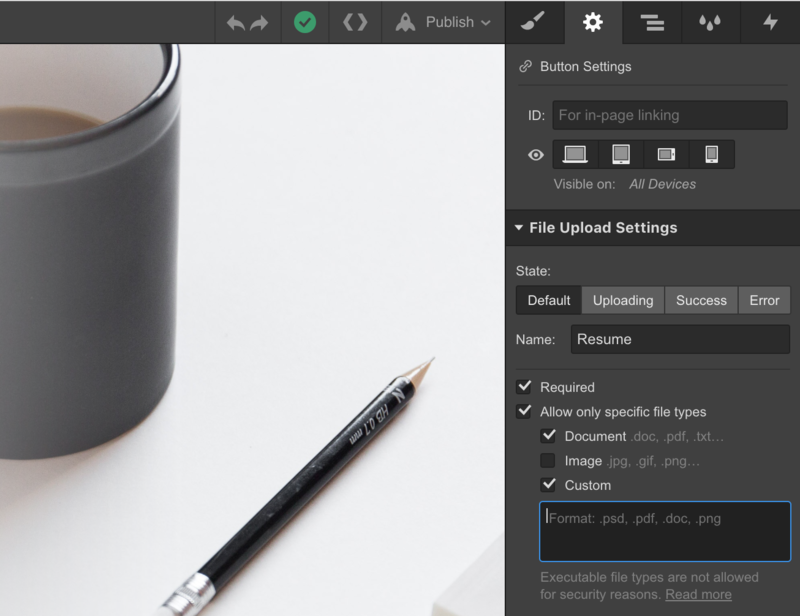 For a closer look at how to add upload buttons to your forms, check out our guide on Webflow University. Note: Your first 10GB of storage for uploaded files is included with Business hosting, then charged at $0.50 per additional GB after that. Add a file upload button to your forms to collect documents, images, media files, and more from your visitors. And of course, style that upload experience however you want. Now available for all sites with Business hosting.